Because when the cameras stop watching, that's when the real action begins. 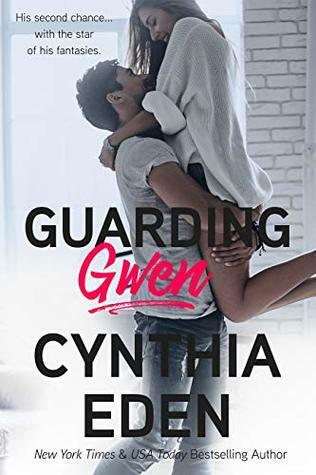 Guarding Gwen by Cynthia Eden follows Protecting Piper where we met Simon Forrest, VP of Wilde Securities. Simon entered the SEALS at age nineteen, leaving behind the love of his life, Gwen. So when Gwenevere Solomon enters Wilde Securities asking for him, he’s shocked that she’s there asking for protection against a stalker. While he can see the fear in her eyes, he can also tell that she’s hiding something, but he’s determined to help her and give his personal attention to the job. Gwen was burned badly when Simon left. His leaving left her broken but as time passed, she dusted herself off and became Gwenevere Solomon, Hollywood It-Girl and everyone wants her. Including the stalker that has become increasingly more terrifying as his threats become personal and the only thing she can think of doing is contacting a ghost from her past to protect her. Simon left, believing that he wasn’t good enough and had nothing to offer Gwen, quickly realizing that he had made a huge mistake but what’s done is done and he can’t rewind the past. Now he has a chance to make it up to her, and remind her that what they had is still just as strong. A second chance romance with lots of suspense that will keep you guessing, I didn’t put this one down until I turned to the last page. Cynthia Eden is always an automatic one-click author for me and I always look forward to reading everything she writes. Can’t wait to read the next book in the series.